We've seen, on more than one occasion, people here play real-life Frogger to disastrous results. 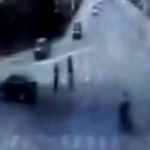 A news show in Heilongjiang Province called Xinwen Yehang (新闻夜航, literally "News Night Flight") has connected the dots -- Frogger... real-life... BAD -- and compiled several dozen examples of jaywalking pedestrians risking their health to get across a street in Harbin called Edmonton Road. 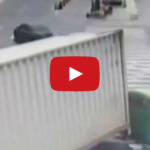 Last week on the Shanghai-Kunming Highway in Jiashan, Zhejiang province, an SUV was desperate to make his exit at all costs. How desperate? Take a look. Fortunately, the two passengers in the SUV suffered non-life-threatening injuries. Live and learn. On Jingcheng Highway just outside Beijing on Sunday, a bus with Chengde, Hebei province license plates lost control after driving over water near the exit of Qilinlou Tunnel. It appeared to hydroplane before tipping over and skidding to a stop after several meters. We're told of the 19 passengers onboard, there was one fatality, an elderly man. The other 18 were sent to nearby hospitals. 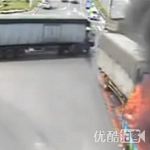 This video, posted earlier today to Youku (after the jump for those in China), depicts a truck carrying liquified petroleum erupting into flames, burning alive the driver of the truck behind it. We've seen the consequences of drivers who confuse accelerators for brakes, which are sometimes awful, but never anything as jaw-dropping as this. 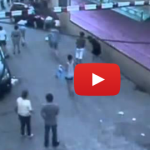 In Ningbo, Zhejiang province on July 26, a red car plows into a woman and child riding an electric bike, and for whatever reason, the car doesn't stop until it hits a wall. 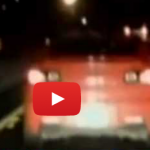 The mother and child completely disappear underneath the car as those nearby are sent scampering. 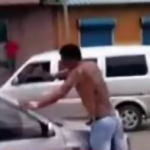 A driver in Wujiang, Jiangsu province recently said "not today" to death when he slid from the driver's to the passenger seat in the nick of time. 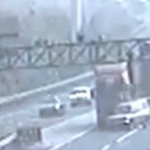 Sensing an oncoming truck with a wide load was about to tip over -- seemingly in slow motion -- the driver managed to reposition himself inside his sedan, which wound up being completely smushed. 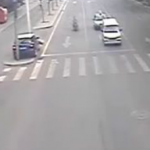 Surveillance cameras in Luoyang, Henan province captured this excellent bit of parallel parking last week. We don't think the world-record holder in parallel parking could do any better... you know, if the requirement was to park between a lamppost and a tree, on the wrong side of the road. Originally posted two days ago, this video called for music, so I added Second Hand Rose's "Wolf Heart Dog Lungs" (二手玫瑰 《狼心狗肺》), which starts at the 15-second mark. Enjoy. Remember the advice that Nanjing motorist -- who, even after suffering a split lip at the hands of a bully on the road, refused to fight back -- gave last week? About the importance of keeping your cool, especially during "summertime," and how "a gentleman uses his mouth, not his fist"? 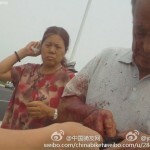 There were some people in Tangshan, Hebei province recently who heeded none of it. First, the video: watch as the driver with the dashboard cam futilely tries to pass the red BMW 4S, whose license plate reads BMW X6 (we understand this car was from a dealership, and the man inside was going for a test-drive). Something obviously happened between these two guys before the recording began, and the road rage must have festered. 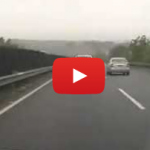 The BMW driver engages in a bit of street gamesmanship for nearly two minutes, then stops, and that's when the dashboard cam driver sprints out of his car and chases after the BMW. 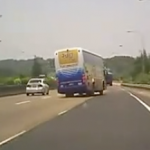 According to SETV (东南卫视) News, an ambulance in Taiwan was recently transporting a critically injured 12-year-old boy when the driver encountered two cars on the highway that did not immediately give way. There was first a BMW, which took three seconds to move over for the ambulance traveling at 180 kilometers per hour. There was then a sedan that apparently never switched lanes, even after the ambulance honked and flashed its lights for 10 seconds. Talk about a thrilling escape. 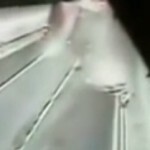 On Friday inside an underwater tunnel in Xiamen, Fujian province, a semi-trailer truck lost control, bounced into the tunnel wall, and appeared to wipe out the unfortunate driver of a black sedan in the far lane. We're told in this video description, however -- and verified by multiple news outlets -- that the car managed to slip underneath the collapsing tractor. 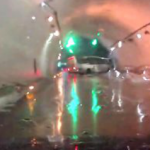 If the driver saw his life flash before his eyes and then a white, blinding light, thank goodness for the latter, which was literally the light at the end of the tunnel. Yesterday in northern Taiwan's Hsinchu, a bus carrying 40 people tipped over on a highway, reason unknown, and according to Xinhua injured all but one person. The driver, a local, died when he was crushed underneath the bus. One of the tour guides was Taiwanese, but all others were from Harbin, Heilongjiang province. 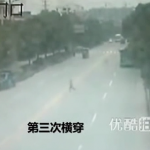 This is not the first time within the last four months that someone playing real-life Frogger in China has been captured on video losing. In March, there was this (I added the music... it seemed appropriate at the time), in which a man sprinting across heavy traffic gets nailed by a van in the furthermost lane. 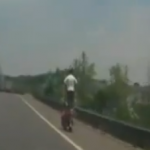 Apparently that video wasn't enough of a deterrence, a clear message that real-life Frogger is a bad idea. Posted onto Youku yesterday (after the jump for those in China), this video already has more than 150,000 views. 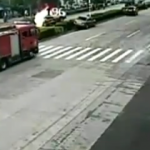 According to the description, a few days ago in Yantai, Shandong province, an oil tanker ran a red light, tipped over, and killed two, injuring another. A driver of a white Fengtian utility vehicle is accused of causing another driver to crash on a Yunnan highway a few days ago. This is news only because the Fengtian, incidentally, is registered under the city's deputy police chief, Wang Weixiong, who has been avoiding phone calls. 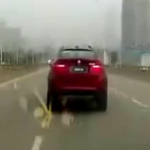 You can watch in the video how, at first, the Fengtian is desperate to pass the smaller car, which doesn't yield to the right lane because there are other vehicles on the road. When the smaller car finally lets the Fengtian pass, the Fengtian driver decides to horse around a bit, presumably out of spite.